I have a terrible memory and am notorious for planning 2 things at the same time due to my forgetfulness. I started using a planner which did wonders for me but am having a hard time keeping it up since the little one came along.... here I am back to double booking myself. 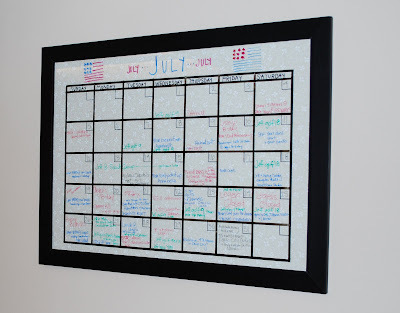 We desperately needed a calendar that was always visible and easily accessible. There you have it. Now I have NO more excuses for forgetting an appointment or being double booked!! I love it and I even spotted my husband looking at it to confirm an appointment time... SUCCESS! Melissa.......GREAT IDEA! The calendar idea is great. And the whole perm. marker thing is perfect for the inside. Anyway, thanks for linking. 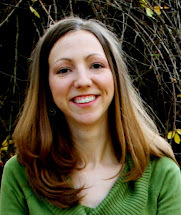 By the way, I was just talking to my sister and she was saying that her sister-in-law (Jaime Gilbert) had a link to your blog about some meal planning that I needed to check out. When you left that comment on my blog, I recognized that name and was like, "Hey, my sister was just telling me about these guys!" Anyway, she was telling me that Jaime is a friend of yours or something (not sure) but that I really needed to check out the meal planning ideas. So thanks......I'm right on top of that! I am in a de-lurking phase right now, so just wanted to tell you that I loved the owl tutorial. It was the first thing I have ever really made on my own, and it turned out so cute! Also, I love the calender idea! I may have to make some Christmas gifts with that idea! Thanks so much. I have the same kind! Love it! I would never go back to a paper one! oh my goodness, I'm ready to go make it now. thanks! Awesome. I think I saw one of these in the Pottery Barn catalog, so think of all the money you saved by making it yourself. Way to go! I made one of these awhile back and love it! How do you store your dry erase markers so that they're nearby when you need them? I'd love to hear your ideas. What a clever girl! Love this idea and might just have to copy it! I had a white board with a calendar already printed on it. Over time it got bent bruised. Your idea has more staying power. I think I might have everything I need. Brilliant! 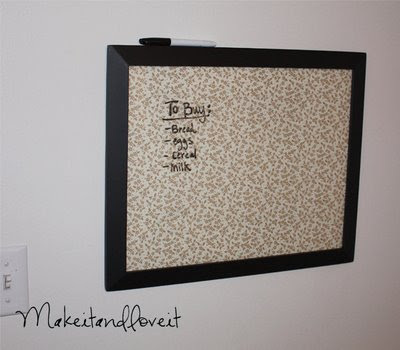 I never thought of making a dry erase board that way. And I love how you figured out how to write the days of the week backwards. I just LOVE this idea! I can't wait to get my supplies for this project! My sister gave me one of these for Christmas and I LOVE IT! Thanks for making this up! I was just wondering how to do something similar!! I love this idea, in fact I love most of your ideas. 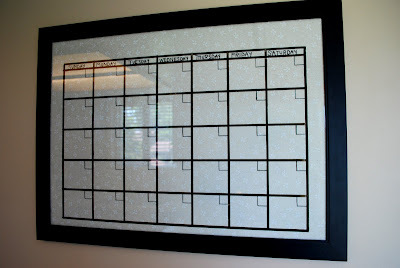 I am in the process of making one and was wondering how you drew your calendar so perfect? I just keep the markers in my junk drawer which is located very near the calendar... not creative but out of the way and very accessible at the same time! Love this idea, and it's so simple! Thank you for sharing it!! What do u use to write the stuff one there? will dry erase work? Super cute idea! HI, I love this and I'm ready to make one. I was wondering if I could use your pictures as an example on my blog? Yes, thanks for asking. Just put a link back to our blog and that will be great. This looks great! I want to make one for my classroom. I'm curious what size picture frame you used. It seems pretty big...maybe 18x24? 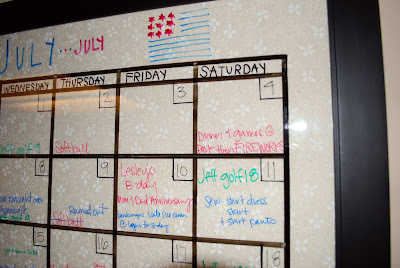 Idea for markers: We used the magnetic tape (which never works the way you want it to) and put it on the dry erase markers, then put them on the magnetic strip covered in fabric from your earlier posts next to it, looks awesome!! You don't care about what you like sports, but I really want to let you know all this. I have been in the attention. I'm loving this idea, i'm just the same, never remember and my hubby is forever moving my diary, i like things on show so i don't forget important things while he hides everything away, i've got a couple of spare frames behind my sofa so may just use one to make this fab project........ what with my own childcare business as well and being a full time mommy things get forgotten easily lol, thank you for all your fab ideas. I was just thinking the other day about making something like this for the foster home we are opening, now you have saved me the trouble of figuring it all out. I want mine to be large and don't want to worry about all of the measuring so was thinking about tearing off a sheet of a desk calendar and putting that behind the glass to trace over. But another idea, instead of tracing with a marker, was using that thin tape that is used for sewing and ??? Now I have to find your post about magnetic strips and fabric mentioned above!